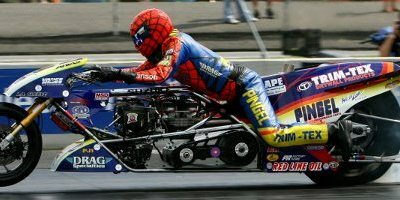 Top Fuel legend, Larry “Spiderman” McBride is poised to entertain race fans with swift and loud nitro runs at this weekend’s Beef O’ Brady’s Thunder Valley Mayhem/Super Chevy Show from Bruton Smith’s spectacular Bristol Dragway in Bristol, TN. McBride seems to be a perfect fit for this speed and adrenaline festival, which features multiple racing categories, Pro Mods, monster trucks, freestyle motocross and a huge fireworks display. The event is very similar to the Norwalk Night Under Fire McBride participated in last month, where Spiderman was one of the most popular attractions. McBride signed autographs for hours and fans cleaned him out of more than 3,000 hero cards. An equally enthusiastic crowd is expected in Bristol. McBride also plans to continue testing his new parachute after a successful debut in Norwalk. Good luck brother its been a long time. We understand the rules of racing. Going fast is one part stopping is the important part.Squeky knows. I was racing him when he didnt stop. God Bless all who believe in jesus. AMEN! Allways loved you. I learned alot from you. Peaseout! Good luck brother its been a long time. We understand the rules of racing. Going fast is one part stopping is the important part.Squeky knows. I was racing him when he didnt stop. God Bless all who believe in jesus. AMEN! Allways loved you. I learned alot from you. Peaceout!